A new entrant in Mumbai’s foodscape, Chef Nidhi Behl isn’t formally trained but her meals are wow-worthy. 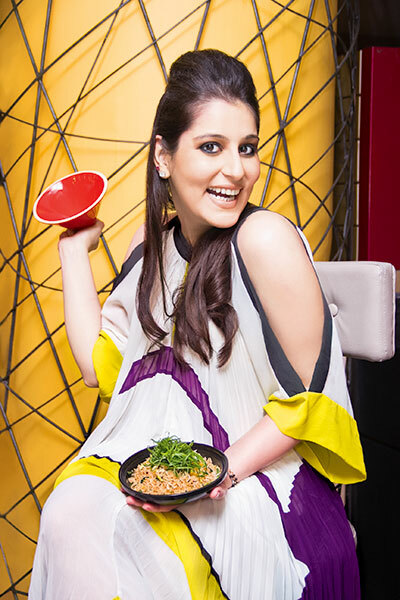 Head chef and owner of Lower Parel-based Byblos, Behl loves to comfort herself with simple but stylishly done food. “I like eating anything from baked ziti, bimbinbap with runny egg, classic tomato soup and African biryani,” says Nidhi. Behl’s preferences for comfort food changes seasonally. So while monsoon snacking calls for classic chai and bhajiyas, she likes to occasionally treat herself to pani puri and homemade rajma-chawal. Says Nidhi, “Apart from these classics, I like to create my own comfort foods too. Like batter-coating mac and cheese, fried into a crispy American pakora.” The recipe dates back to her college days in Boston. Nidhi usually likes to eat while watching television, “Especially cookery shows murmuring in the background, while I catch up on my day with my family,” she concludes. Mini doughnuts, 6; Chocolate mousse, 2 tbsp; Chocolate jelly, 3 tbsp; Dulce de leche, 4 tbsp; Chocolate ganache, 4 tbsp; Belgian chocolate ice-cream, 1 scoop; Salted caramel ice-cream, 1 scoop; Malted vanilla ice-cream, 1 scoop; Cookie crumbs, nuts, marshmallows and sprinkles to garnish. In a tall glass, place the first two doughnuts and layer with the ice-creams, mousse, dulce de leche and chocolate ganache. Add a few cubes of chocolate jelly and layer it with a few more doughnuts. Continue until you have exhausted all the ingredients and garnish with nuts, cookie crumbs, marshmallows and sprinkles before serving.